This page documents the format of the Tytera DM380/Retevis RT-3 codeplug binary file. This is not an official format definition but it has been determined by changing settings with the “CPS RT3” program version V1.30.0. This specification is used by the rdt2csv conversion utility to export/import codeplugs in the CSV format. The codeplug, with extension “.rdt”, is a binary file of a fixed size of 262709 bytes. All information inside is allocated at fixed positions. Data inside the codeplug is divided in records. Every record has its own format. Some records are available in single instance (for example, the record describing the “General Settings”), while other records are repeated (for example, records describing the “Channel Information” have one record for each channel). Multiple records are always allocated in sequence within the codeplug file. Records are always octet aligned. The records are divided in fields. Each field represent an edit box, a check box or other field in the editor card. Fields can be as small as one bit or as long as 16 octets. The field table will give the offset in bits of the field within the record and the length in bits of the field. So, bit #0 will be the MSB of the first octet of the record; bit #7 will be the LSB of the first octet, while bit #8 will be the MSB of the second octet and so on. Fields are encoded according an encoding type among those specified below. The BCD (Binary Coded Decimal) format divides a decimal number in digits and codes each digit in a group of 4 bits. In this case encoding is little-endian. For example, value 12345678 is encoded as 0x78 0x56 0x34 0x12. Same as BCD, but encoded big-endian. For example, value 12345678 is encoded as 0x12 0x34 0x56 0x78. This is a BCD format with exception used only in CTCSS/DCS fields specification. 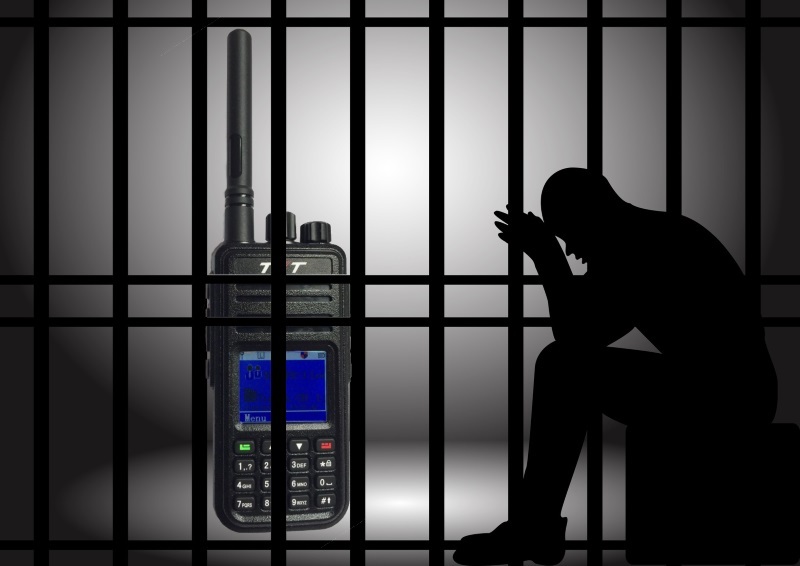 Tones are of three types: CTCSS (like 127.9) DCS-N (like D155N) and DCS-I (like D155I). 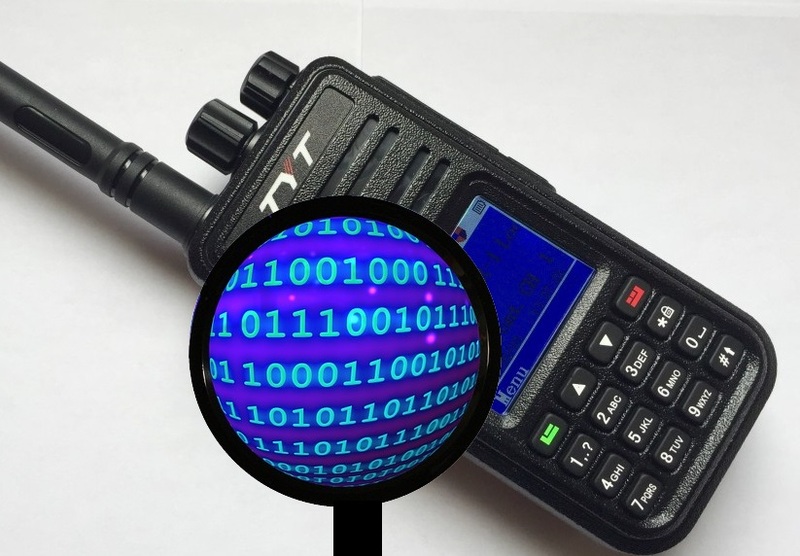 They are coded as two-octets little-endian BCD but with an exception: the two most significant bits of the second octet are to be extracted and used as follow: 00=CTCSS, 10=DCS-N, 11=DCS-I. Once removed, the remaining BCD value is the number. This is normal binary little-endian encoding. If size is less or equal to 8 bits, the field is always contained in a single octet. If the size is greater the 8 bits, then size is always a exact multiple of 8 bits and the field will be octet aligned. Unicode encoding is a sequence of little-endian 16-bit values. Although it can host any 16-bit Unicode value, only values <= than 255 (U+00FF) are shown correctly. The Unicode strings are always allocated to their maximum size; if shorter than their maximum size, unused characters are zeroed. If the maximum size is used, no zero terminator is available. Ascii encoding is made of simple one-octet long characters. The Ascii strings are always allocated to their maximum size; if shorter than their maximum size, unused characters are zeroed. Tables supporting multiple records (for example Channel Information, Scan List, Zone Information, etc) have always all records allocated. So, if Channel Information supports a maximum of 1000 entries, in the codeplug file there will always be 1000 entries. The unused entries are marked with one or more octets that are set to a given value when the record is not used. When setting the a record to empty, the safest strategy is to set it to its “initial condition”. The “initial condition” is the configuraton used by the “CPS RT3” editor program when creates a new “default1.rdt” empty codeplug. Some types of records are initialized to zero, while other are initialized to 0xFF. In every case, the Unicode and Ascii strings are to be initialized to zero. The “Default zero value” in the table below specifies this detail. When a record is deleted, the CPS RT3 editor does not clear its contents to its initial state but simply sets one or bytes to a prefixed value. Therefore, the decoder must check these octets only to determine whether a record is active or deleted. The bits to be checked are described in the “deletion markers” table of every record descriptor below. The tables below describe all the available records and their internal format. ContactName Binary 48 16 Set to a valid position in table DigitalContact. ScanList Binary 88 8 Set to a valid position in table ScanList. GroupList Binary 96 8 Set to a valid position in table DigitalRxGroupList. Name Unicode 256 256 Maximum length: 16 characters. Name Unicode 32 256 Maximum length: 16 characters. Name Unicode 0 256 Maximum length: 16 characters. ContactMember01 Binary 256 16 Set to a valid position in table DigitalContact. ContactMember02 Binary 272 16 Set to a valid position in table DigitalContact. ContactMember03 Binary 288 16 Set to a valid position in table DigitalContact. ContactMember04 Binary 304 16 Set to a valid position in table DigitalContact. ContactMember05 Binary 320 16 Set to a valid position in table DigitalContact. ContactMember06 Binary 336 16 Set to a valid position in table DigitalContact. ContactMember07 Binary 352 16 Set to a valid position in table DigitalContact. ContactMember08 Binary 368 16 Set to a valid position in table DigitalContact. ContactMember09 Binary 384 16 Set to a valid position in table DigitalContact. ContactMember10 Binary 400 16 Set to a valid position in table DigitalContact. ContactMember11 Binary 416 16 Set to a valid position in table DigitalContact. ContactMember12 Binary 432 16 Set to a valid position in table DigitalContact. ContactMember13 Binary 448 16 Set to a valid position in table DigitalContact. ContactMember14 Binary 464 16 Set to a valid position in table DigitalContact. ContactMember15 Binary 480 16 Set to a valid position in table DigitalContact. ContactMember16 Binary 496 16 Set to a valid position in table DigitalContact. ContactMember17 Binary 512 16 Set to a valid position in table DigitalContact. ContactMember18 Binary 528 16 Set to a valid position in table DigitalContact. ContactMember19 Binary 544 16 Set to a valid position in table DigitalContact. ContactMember20 Binary 560 16 Set to a valid position in table DigitalContact. ContactMember21 Binary 576 16 Set to a valid position in table DigitalContact. ContactMember22 Binary 592 16 Set to a valid position in table DigitalContact. ContactMember23 Binary 608 16 Set to a valid position in table DigitalContact. ContactMember24 Binary 624 16 Set to a valid position in table DigitalContact. ContactMember25 Binary 640 16 Set to a valid position in table DigitalContact. ContactMember26 Binary 656 16 Set to a valid position in table DigitalContact. ContactMember27 Binary 672 16 Set to a valid position in table DigitalContact. ContactMember28 Binary 688 16 Set to a valid position in table DigitalContact. ContactMember29 Binary 704 16 Set to a valid position in table DigitalContact. ContactMember30 Binary 720 16 Set to a valid position in table DigitalContact. ContactMember31 Binary 736 16 Set to a valid position in table DigitalContact. ContactMember32 Binary 752 16 Set to a valid position in table DigitalContact. InfoScreenLine1 Unicode 0 160 Maximum length: 10 characters. InfoScreenLine2 Unicode 160 160 Maximum length: 10 characters. PcProgPassword Ascii 768 64 Converted to lower case; if not set, set to all 0xFF. RadioName Unicode 896 256 Maximum length: 16 characters. PriorityCh1 Binary 256 16 Set to a valid position in table ChannelInformation. PriorityCh2 Binary 272 16 Set to a valid position in table ChannelInformation. TXDesignatedCh Binary 288 16 Set to a valid position in table ChannelInformation. ChannelMember01 Binary 336 16 Set to a valid position in table ChannelInformation. ChannelMember02 Binary 352 16 Set to a valid position in table ChannelInformation. ChannelMember03 Binary 368 16 Set to a valid position in table ChannelInformation. ChannelMember04 Binary 384 16 Set to a valid position in table ChannelInformation. ChannelMember05 Binary 400 16 Set to a valid position in table ChannelInformation. ChannelMember06 Binary 416 16 Set to a valid position in table ChannelInformation. ChannelMember07 Binary 432 16 Set to a valid position in table ChannelInformation. ChannelMember08 Binary 448 16 Set to a valid position in table ChannelInformation. ChannelMember09 Binary 464 16 Set to a valid position in table ChannelInformation. ChannelMember10 Binary 480 16 Set to a valid position in table ChannelInformation. ChannelMember11 Binary 496 16 Set to a valid position in table ChannelInformation. ChannelMember12 Binary 512 16 Set to a valid position in table ChannelInformation. ChannelMember13 Binary 528 16 Set to a valid position in table ChannelInformation. ChannelMember14 Binary 544 16 Set to a valid position in table ChannelInformation. ChannelMember15 Binary 560 16 Set to a valid position in table ChannelInformation. ChannelMember16 Binary 576 16 Set to a valid position in table ChannelInformation. ChannelMember17 Binary 592 16 Set to a valid position in table ChannelInformation. ChannelMember18 Binary 608 16 Set to a valid position in table ChannelInformation. ChannelMember19 Binary 624 16 Set to a valid position in table ChannelInformation. ChannelMember20 Binary 640 16 Set to a valid position in table ChannelInformation. ChannelMember21 Binary 656 16 Set to a valid position in table ChannelInformation. ChannelMember22 Binary 672 16 Set to a valid position in table ChannelInformation. ChannelMember23 Binary 688 16 Set to a valid position in table ChannelInformation. ChannelMember24 Binary 704 16 Set to a valid position in table ChannelInformation. ChannelMember25 Binary 720 16 Set to a valid position in table ChannelInformation. ChannelMember26 Binary 736 16 Set to a valid position in table ChannelInformation. ChannelMember27 Binary 752 16 Set to a valid position in table ChannelInformation. ChannelMember28 Binary 768 16 Set to a valid position in table ChannelInformation. ChannelMember29 Binary 784 16 Set to a valid position in table ChannelInformation. ChannelMember30 Binary 800 16 Set to a valid position in table ChannelInformation. ChannelMember31 Binary 816 16 Set to a valid position in table ChannelInformation. Text Unicode 0 2304 Maximum length: 144 characters. ChannelMember01 Binary 256 16 Set to a valid position in table ChannelInformation. ChannelMember02 Binary 272 16 Set to a valid position in table ChannelInformation. ChannelMember03 Binary 288 16 Set to a valid position in table ChannelInformation. ChannelMember04 Binary 304 16 Set to a valid position in table ChannelInformation. ChannelMember05 Binary 320 16 Set to a valid position in table ChannelInformation. ChannelMember06 Binary 336 16 Set to a valid position in table ChannelInformation. ChannelMember07 Binary 352 16 Set to a valid position in table ChannelInformation. ChannelMember08 Binary 368 16 Set to a valid position in table ChannelInformation. ChannelMember09 Binary 384 16 Set to a valid position in table ChannelInformation. ChannelMember10 Binary 400 16 Set to a valid position in table ChannelInformation. ChannelMember11 Binary 416 16 Set to a valid position in table ChannelInformation. ChannelMember12 Binary 432 16 Set to a valid position in table ChannelInformation. ChannelMember13 Binary 448 16 Set to a valid position in table ChannelInformation. ChannelMember14 Binary 464 16 Set to a valid position in table ChannelInformation. ChannelMember15 Binary 480 16 Set to a valid position in table ChannelInformation. ChannelMember16 Binary 496 16 Set to a valid position in table ChannelInformation. I see there are still a few uncharted segments. Incidentally, if you want to use a CS-700 file with the MD-380, open the payload in a hex editor and substitute these bytes. CS700 ASCII	D	6	8	0	. MD-380 ASCII	D	R	7	8	0	. This is a terrific resource. Thanks for publishing it. On your Channel Information format, I think your CompressedUdpHdr are reversed. Build was successful. However I can't verify if this breaks any other architecture, or 32bit Linux. Thanks for your work! Very useful tool. Thank you for reporting. I published the fixes and tested under a recent x64 linux compiler. Thanks for posting this information – it was a huge help to me in a project I’m working on. Thanks for all your work on this. I used it in developing a codeplug editor, . In the process, I found an error in the Digital Contacts deletion marker. 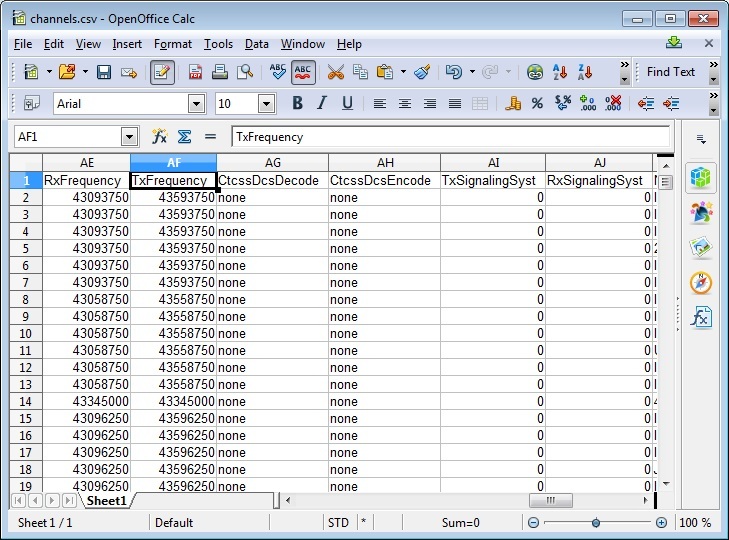 Three 0xff bytes at the beginning of the record signify a CallId of 16777215, which is the call id of CallType “all”. The actual deletion marker I saw is two 0 bytes at a bit offset of 32, representing a zero-length contact name. Thanks again. Thank you for reporting: I have updated this table and the rdt2csv source files as well.